I haven't done a repack wars recently because any repacks I buy tend to be junk. 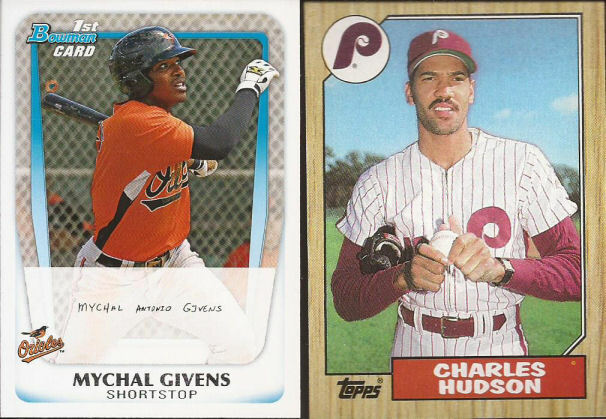 Lately Fairfield has been packing them with either 2015 Topps, Panini Triple Play or last 80's junk wax (Score or Fleer). And sure, the repacks at the dollar store contain junk as well, they are a far cheaper rip than $12 for 100 cards, more than 50% I know I won't need. Over the past couple weeks, I've been forced to hit the dollar store, and each trip I picked up 4 packs. 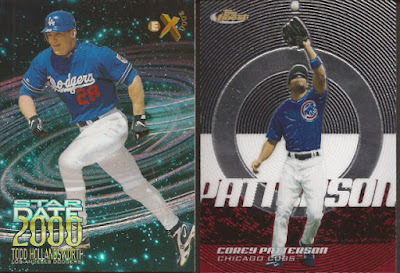 First four were the multi sport repacks of 30 cards (or so) and the 2nd trip brought home 20 card baseball only packs. Let's have some scans. Starting with one of the 30 card multi sports, I have broken the scans down to the oldest card in the pack (this Miller from 1981), the best card in the pack for my collection (Brookens laying down a bunt) and the best card overall in the pack, which happens to be an Electric Ice of HOFer Biggio. I might build that '81 set. Though I think I will first build the 1981 hockey release. As I mentioned, this was one of the multi sport releases. All but these two cards were baseball. Sorry Seattle, this was a good look for you. Ditch the neon green. 2nd multi sport pack, with the oldest being the man who could not keep his cap on his head, John Pacella. A 1983 Bo goes into the Sox Box. And the awesome SC release of Hudler performing an act on a dugout pole that got him called to HR was the best of the pack. Just two non baseball in the pack. 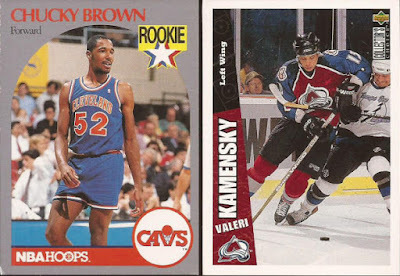 Chucky Brown's rookie from Hoops and a Collector's Choice of Valeri Kamensky. 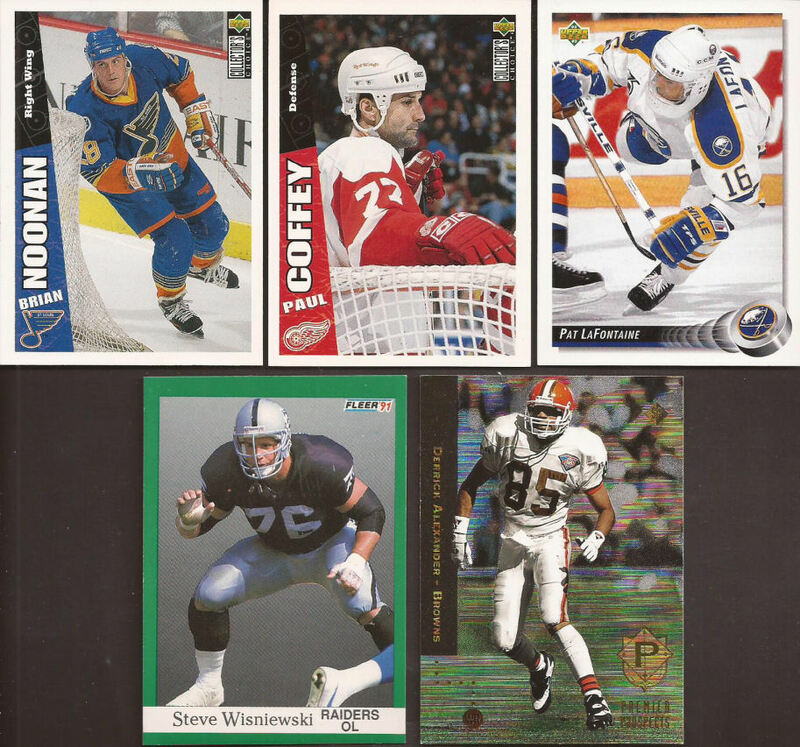 Even the hockey Collector's Choice sets were primo releases. 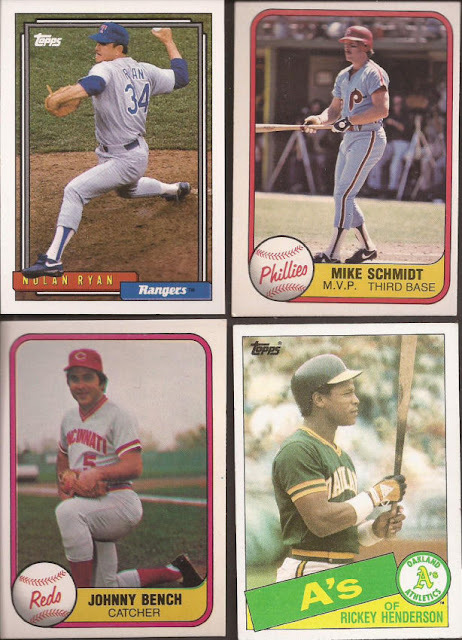 A couple 1985 Topps cards get the oldest designation, with the Gleaton being the only real card I would want (but don't need). How about a Mother's Nolan Ryan, though? Nice pull for 3 cents. 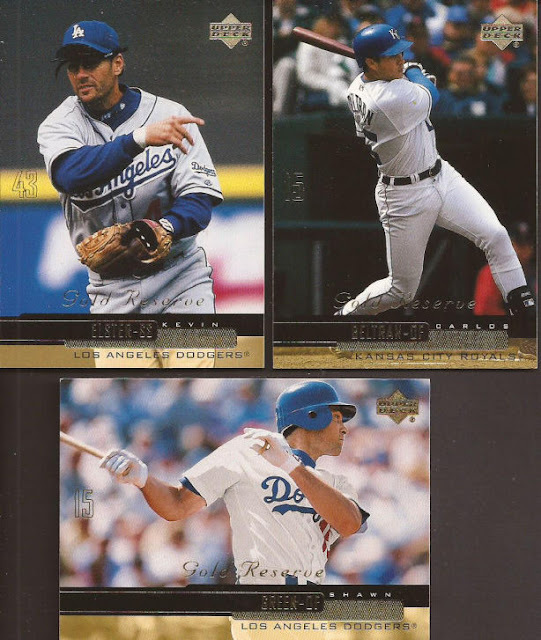 I thought this was interesting: pulled 3 Upper Deck Gold Reserve cards from their 2000 set. This was the worst of the 4 multi sport packs, yielding me 5 non baseball cards. Love the jaw guard on LaFontaine's helmet. Noonan is an ex-Blackhawk. Technically, Coffey is too, for 10 forgettable games. You try and pick the best card from those 4. Anyone of you would pay a dime for those. I paid 3 pennies each. 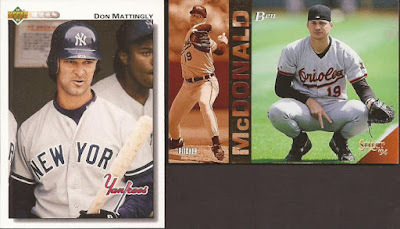 Not a single non baseball card in the pack, so how about I show off 3 OPC cards that were in the stack? That was the last of the 30 card multi sport. Let's look at the 20 card baseball packs. Tend to be newer cards, but still some old gems to be found within. 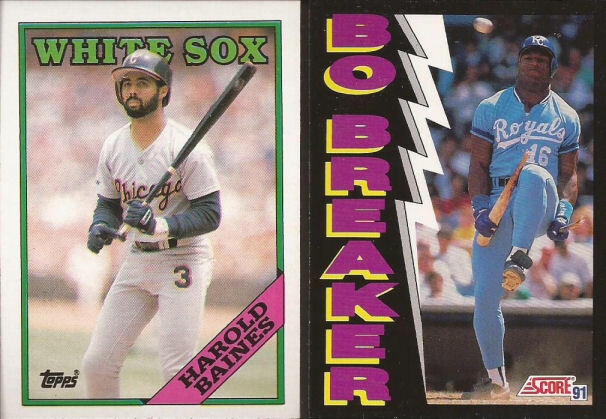 1988 Harold Baines was the oldest in the pack, but the amazing Bo Breaker card secures both the best for my collection and the best within the pack. That man could do anything. Here's a few other highlights from that pack. Wallach goes to you know who. An OPC Candy Maldonado. And Alomar Jr.? Note the McDonald's logo in the upper right. Oddball! Speaking of Tim Wallach, I will now want all your '85 Mike Heath as I got two in this repack. (No - I don't. Just kidding). No cards for my collection at all, but a really nice Grace SP. I love that set. Amazing images, even if the border on the left side ruins it a bit. 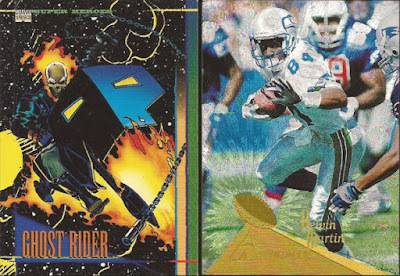 It was Upper Deck's version of Stadium Club. 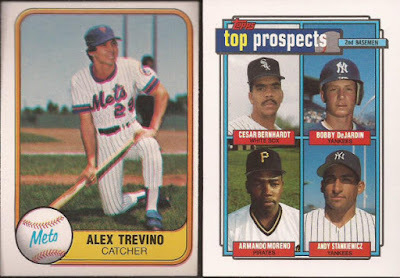 1987 Donruss for the oldest card. 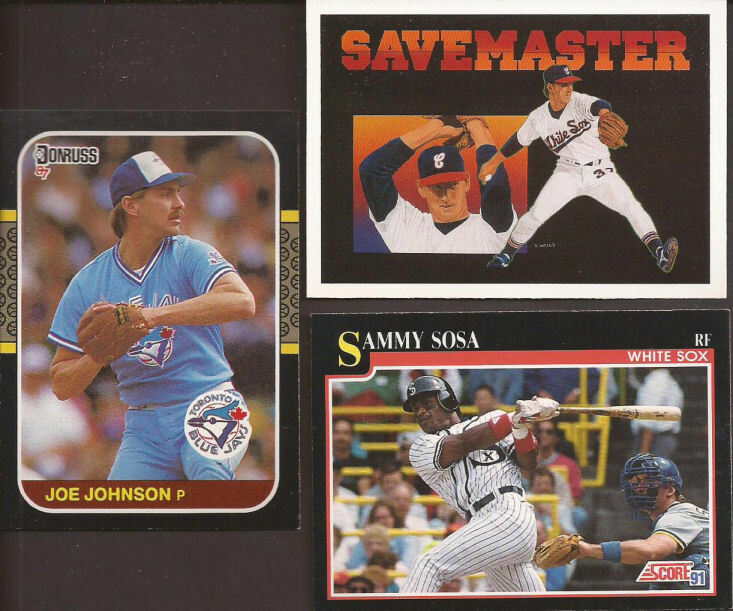 I have both the SaveMaster and the Sosa throwbacks, but I had to pick best for the collection and best card. I think that Sosa is one fine throwback. Love the card coloring when paired with the 1919 Sox unis and Sosa's wrist bands. Mattingly without a mustache always freaks me out. Like seeing a skinny Rick Reuchel. And hey Nick, does that McDonald count as a pitcher at the plate? I think it should. We end the 8 packs with a dud. There were 87 Donruss within, but you have seen enough, so let's show an '87 Fleer. 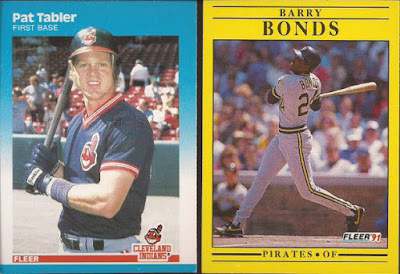 And when a 1991 Fleer Bonds is called the best in the pack (and frigging BANK 25 years ago), you see how weak the cards for a buck were. Not a single White Sox either. The 20 card baseball repacks, though, are always good for shiny, one or two year off sets. Or higher end, as a Hollandsworth Fleer EX and a Patterson Topps Finest will attest to. Not amazing, but well worth a nickel each. So there ya go - eight repacks. And look - I've posted 3 days in a row! Put on your dancing pants! Never seen that McDonald before. I think I'll count it as a Pitcher at the Plate. Love that zany Hollandsworth insert, too. Great variety there. I fondly remember seeing those McDonald's cards up here in Canada. Never excited me much like the hockey ones did. Not sure what's up with the Rex card but I'm guessing they were trying something different there!